(SPRINGFIELD, MO.) - With four weeks left until election day, the Obama campaign knows how sweet victory could be, and they want a taste of it early. So the Biden traveling staff is bringing back a little present to Obama headquarters in Chicago: a two-foot sheet cake in the shape of the electoral map, showing what an imaginary clean-sweep of the country would look like for Obama. Every state was smothered in "blue state frosting" with the exception of two, McCain and Palin's home states of Arizona and Alaska. Instead of a message like "Happy Birthday" or "Congratulations" the cake had "NOV. 5, 2008 SCORECARD" across the top, and below it the imaginary electoral tallies, "Obama/Biden 525, McCain/Palin 13". 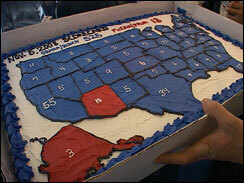 The cake was large enough for a small army of staffers (Texas alone could serve four) and each state had the number of electoral votes delicately written in white frosting. Aside from its incredibly lopsided vote totals, the dessert had a few teensy mistakes – Massachusetts and New Hampshire's electoral vote count were switched. And one of Biden's staffers admitted that while Nebraska should be red, he said the bite with Omaha's district would likely go to Obama. A box of United States shaped cookies are going to Obama headquarters as well, sprinkled entirely with blue sugar and dotted with a cinnamon red hot for Arizona. The goodies were made in a Columbia, Mo., bakery according to the campaign, who would not give details but showed the cake off to press members on Biden's airplane. Just a small, colorful slice from the campaign trail.